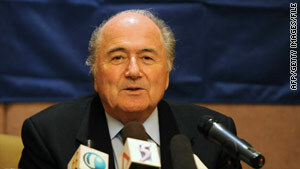 FIFA President Sepp Blatter says the group is looking into allegations that officials asked for bribes. London, England (CNN) -- World soccer's governing body is investigating a newspaper report that two of its officials solicited a bribe in exchange for supporting particular countries' bids to host the World Cup tournament, it announced Sunday. "FIFA will immediately analyse the material available and only once this analysis has concluded will FIFA be able to decide on any potential next steps," International Football Federation President Sepp Blatter said in a statement. He was writing to members of the body's executive committee after the Sunday Times of London newspaper published an article under the headline "World Cup votes for sale." "FIFA and the FIFA Ethics Committee have closely monitored the bidding process for the 2018 and 2022 FIFA World Cups and will continue to do so," Blatter wrote in the open letter. "FIFA has already requested to receive all of the information and documents related to this matter, and is awaiting to receive this material," he said. He said he would not make further comments and asked committee members not to do so either. The Sunday Times said it had conducted an undercover operation, approaching six current or former FIFA officials to ask them to act as "fixers." The newspaper said all six officials "suggested paying huge bribes to FIFA executive committee members." Two of the six asked for payment themselves. The committees behind each country's bids "have denied any improper approaches or wrongdoing," the article said. FIFA is on the verge of deciding which nations will host the tournaments in 2018 and 2022. The World Cup is one of the biggest sporting events in the world when it is held every four years.